Auto-winding mags are becoming an ever-increasingly popular choice for airsoft players. If you've ever used one, then you will be aware of the advantages that are attained from using an auto-winder. If you haven't used one before, then you're missing out. The raison d'être for using one is apparent in the name itself: that it automatically winds the BBs on, unlike the standard mags which necessitate manual winding, usually with a thumb wheel. Although having to wind a magazine can hardly be described as a strenuous task, it kind of takes the flow away, especially if you need to get that crucial shot in only to realise that the mag needs to be wound. So it is with great pleasure that I introduce the latest Milspex Auto-Winding Magazine. It comes with an excellent specification at an equally excellent price. Based on the FIRST FACTORY box magazine design, this capacious drum mag holds 4000 rounds and winds the BBs via a motor that is triggered by pressure switch and powered by a 8.4v built-in re-chargeable NI-CD battery (charging plug and cable included). 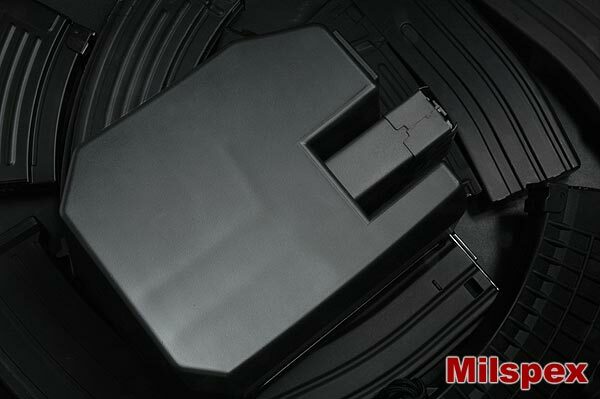 Milspex currently produces this box magazine for the G36 and G3. The M16 model will be released later. Available now, exclusively at Redwolf! Please check the detailed pictures below for more closeups! Please check the detailed pictures below for more closeups!